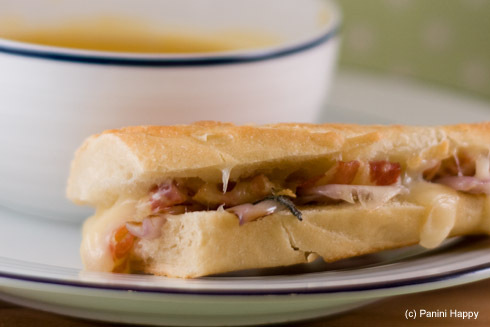 If I tell you that today’s Pancetta, Fontina & Caramelized Shallots Panini recipe was inspired by Rachael Ray, I imagine some of you will perk up a little while others will scroll quickly to the next item in your RSS reader. She’s kind of got that polarizing effect on folks. Myself, I’m a Rach fan. No, I don’t love every 30-minute meal (still shaking my head over the concept of bread gnocchi) and some of the cutesy catchphrases can grate at times (notice that I’ve tried my hardest never to use the word “sammie” on this blog!). But I gotta respect her for the honest, upbeat, creative and successful person that she is. She works hard and she’s got a whole lot to show for it. So, yeah, I’m a fan. A few weeks ago during the cooking segment on her talk show Rachael grilled Fontina and sage panini to pair with her Beef and Barley Stoup (again with the words!). I’ve been thinking about that savory Fontina and sage combo for weeks. And while I don’t do “stoup” I’ve really been loving butternut squash soup this season. So when I finally grilled my own version of Fontina and sage panini yesterday to go with butternut squash soup I took a flavor cue from Andrea at Andrea’s Recipes and added in some crispy pancetta and sweet caramelized shallots. Deluxe grilled cheese for sure! Toss shallots with olive oil to coat and place cut-side down onto the panini grill. Close the lid and grill for 6-7 minutes until caramelized. Leave the residual shallot-infused oil on the grates – it will add great flavor once you grill the sandwich. Alternatively, you could roast the shallots on a rimmed baking sheet in an oven or toaster oven at 400 degrees for 15-20 minutes. Meanwhile, cook the slices of pancetta – either in a toaster oven broiler pan at 375 degrees for about 5 minutes or in a skillet over medium-high heat until the fat renders and the pancetta is crispy. Place 3-4 shallot halves on the bottom baguette (fan out the layers to cover the bread). Sprinkle sage on top of the shallots. Add pancetta and Fontina and close the sandwich. Grill for 5-6 minutes until the cheese melts. Serve immediately and enjoy! This sandwich looks tasty! A perfect match with soup. Your panini looks wonderful. You’re so right about Rachel having a polarizing effect on folks. I used to watch her show, sometimes just to see what icky thing she was making–her stoups really turn me off–but she was funny, so tolerable if I was kind of half watching. Then I caught her on an episode of Foodnetwork’s Next Star and both she and Paula Dean were so high and mighty (and Rachel was downright nasty to the perky little blonde) that I stopped watching both. I’m a 60’s chick who still believes in the boycott (I also boycotted the Olympics). She does drive me nuts at times but I don’t dislike here. This sandwich sounds divine! Oh Rachel Ray.. Sher’s alright I guess. At least she’s no semi-homemade devil mistress. Oh this sandwich has so many things I love. Now that’s a sandwich I can sink my teeth into. Yum! Previous post: Panini Happy is on Facebook!